For many, the words “kitchen renovation” conjure up images of dust, drywall, and a depleted bank account. But who said renovations had to be costly and destructive? At Booth7, we work with your existing cabinetry, providing top-notch painting and cabinet refinishing services in the greater Toronto area and surrounding regions. To us, renovations take on a whole new meaning. Instead of demolishing your old kitchen, cabinets, furniture, or walls, our expert teams use top-of-the-line products to refinish or repaint your items, making them look like new again. Every day, our goal is the same: to put a smile on customers’ faces. From the first contact to the last detail, we have your best interests in mind. As a local company, and a team of homeowners, we understand how expensive renovations can be. That’s why we offer our services at one of the most affordable rates on the market. Whether you’re looking to refresh old family furniture or revamp your kitchen without starting from scratch, Booth7 provides outstanding service at a reasonable cost, so you won’t have to break the bank. To show how much we care, we offer all customers free consultations and estimates. At Booth7, customer satisfaction is a priority. 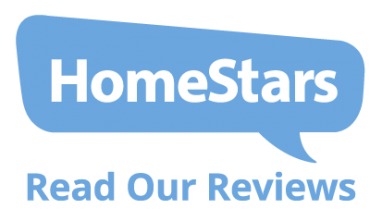 You only need to look Online at our Homestars reviews to see how our customers feel about our service level. In addition to top-of-the-line service, you can always expect friendly and approachable staff, happy to deal with any queries. No matter what your request, we’re happy to accommodate your individual needs. At Booth7, we believe success is only achieved when the customer is satisfied with their results. After each project, we go over our work with the client, and if there are any imperfections, or the client is dissatisfied in any respect, we immediately rectify the issue. If you’re looking to give your home a modern new look while staying within your budget, Booth7 is the answer. With knowledgeable and friendly staff and years of in-depth experience, we have what it takes to give you a product you love. To learn more about our services, or to get in touch with our experts, contact us today!